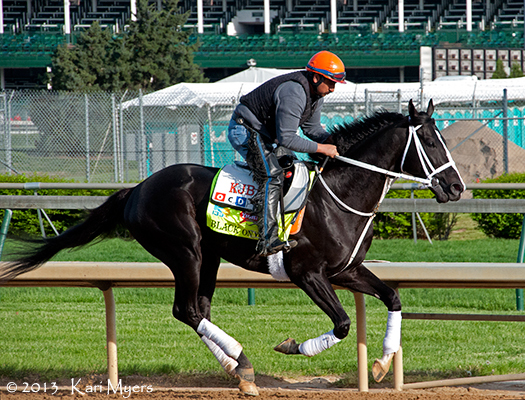 These photos were taken the morning of May 2, 2013 at Churchill Downs. Rosie Napravnik works a Wayne Catalano trainee. The lovely Black Onyx out for a gallop. He was scratched from the Kentucky Derby the following morning due to a non-displaced ankle chip. He’s fully recovered and back in training now. Verrazano preps for the Derby. 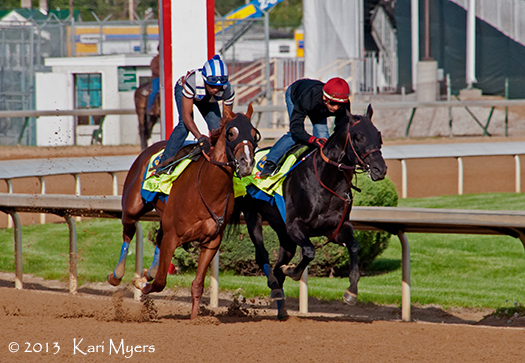 The Bob Baffert graded stakes winners Power Broker (outside) and Govenor Charlie. Multiple Grade 1 winner Close Hatches. She was also a finalist for an Eclipse award for Champion Three-Year-Old Filly (won by Beholder). This entry was posted in Racing and tagged Black Onyx, Churchill Downs, Close Hatches, Govenor Charlie, morning workouts, Power Broker, Rosie Napravnik, Verrazano by Admin. Bookmark the permalink.